Yesterday I harvested garlic — about 125 heads. I have garlic to meet all our needs — for livestock medicine and for cooking, for planting next season and for sharing. Our grocery stores sell garlic. It all comes from China. There is local garlic at the farmer’s market at about $1.25 per head. A good price. Garlic is essential for cooking most ethnic dishes. It is essential for health and well being. Its your first line of defence against colds, flu, and infection. In the stable it is used for infections, like mastitis, general weakness, and for parasite infestations. And it tastes good. Canada has the capacity to be self sufficient in garlic. There are garlic varieties for every North American growing condition. The essentials are fertile soil, high in humus, and seasonal cold temperatures, that encourage sprouting and bulbing. I grow hardneck garlic — which does better in cooler climates. 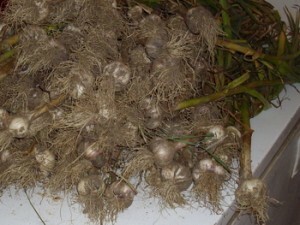 If your area has wild onions, and wild garlic then you will be able to grow garlic with ease. You can buy seed garlic from many seed companies. Garlic seeds are the cloves of garlic that make up a head or bulb of garlic. I got my garlic seed at the farmer’s market. Tell the grower that you plan to plant it and ask if they have any soil diseases before you buy for your own crop. Most ethical farmers will sell you seed garlic from clean fields, if you tell them you plan to grow your own. If you don’t say, they won’t know to steer you clear of undesirable soil organisms. Garlic is planted in the Fall, in a well tilled and well composted bed — October here. We amend the garlic bed with composted manure. You need to separate the cloves of garlic from the head, being careful not to damage the papery skins. Each clove has a top and bottom. The top is a bit pointed and the bottom — the root end — is flat. You want to plant the garlic clove with the root end down and the top up. Plant it about 4 inches down, 6 inches apart with rows 6 inches apart. Spread a thick mulch on the top — 2 to 4 inches. And leave it till Spring. Our winter temperatures go down to -40C at times and the garlic remains good, under a snow cover. Where there is a Chinook that drives away the snow, garlic can be kept in the fridge over the winter and planted out in the spring, as soon as the ground can be worked. The chill is essential for the heads to develop cloves. Garlic is almost carefree. Keep the bed well weeded and watered in the early growth period — till the end of July. At the beginning of July the garlic will send up a flower stalk. I break these off when I see them — I believe they weaken the bulb and give you smaller bulbs. Others disagree and allow the flower to grow and mature bulbets. You can use the scapes — garlic flower stalks — in stir fries or soups — or feed them to livestock. They are full of garlic flavour. If you let them grow bulbets — these can be planted for future garlic but will take two years to produce viable bulbs. If your area suffers from soil organisms that will damage garlic, bulbets are free of soil diseases and will let you get a fresh start, in a new bed. Garlic tolerates frost well — even summer frost — and grows well in mountainous areas. It doesn’t like to have its feet wet, so plant in raised beds if your area is prone to residual soil moisture. Garlic is harvested in August, when the plants are 2/3rds yellow and 1/3rd green, the heads are tightly wrapped and haven’t burst yet. They will keep well into winter if the heads haven’t broken open. Once they are harvested they should be dried in the shade. Garlic will last longer if you braid them and hang them to dry. Don’t wash them first. I braid them outside in the carport because the process is a bit messy. Tomorrow I’ll share with you how I braid garlic to preserve it for the winter. After braiding, when they are part way dry, I brush off the dirt and trim the roots and bring them in the house to finish the process. I’ve had them last into the next garlic harvest, braided and hanging in my kitchen. If you put them in a cool, dry place — they will sprout in the spring. The coolness of a root cellar signals them to begin growing. If you cut off the stalks and store them as heads of garlic, they will last until midwinter before sprouting or drying out. Save your largest heads for planting out in October for your next year’s crop. If you always plant your largest heads you will keep your seed strong and viable for many years. When the new harvest comes in, I take my garlic, leftover from the previous season, peel it and dry it in the dehydrator, and grind it for garlic powder. Dried at a low temperature, the garlic retains some of its medicinal qualities. You can cook with the garlic powder or spoon it into gelatin capsules and take it as medicine. I use mostly fresh garlic for cooking. Tomorrow I’ll show you how to braid garlic to preserve it for the winter. What garlic growing experience can you share with our readers? Do you have a favourite garlic variety? Leave a comment. I’d always heard you should leave the first crop in the ground… I made the mistake of harvesting my first crop but then again I didn’t re-seed so (duh!) I did not get a 2nd crop. Also tried to plant garlic purchased from an organic produce stand … no luck here either!